Looking for a new full-size car to give you a little extra room and style in your ride? If so, you may want to take a closer look at the 2018 Toyota Avalon. Toyota has a reputation for putting out stylish, reliable cars, and the 2018 Avalon is no different. For shoppers in the Avon, Indianapolis, and Plainfield areas, our team at Andy Mohr Toyota has written this 2018 Toyota Avalon review so you can learn all you need to know about this exciting vehicle. We’ll cover performance specs, interior space, and high-tech features. Sit back and enjoy the ride! The 2018 Avalon’s powerful V6 engine and six-speed automatic transmission offer 268 horsepower and 248 lb-ft of torque, giving you a swift ride that’ll let you merge with highway traffic and pass slower-moving cars without a problem. The car’s fully independent suspension and stabilizer will make sure you have a smooth commute. The Avalon also boasts a strong fuel economy. 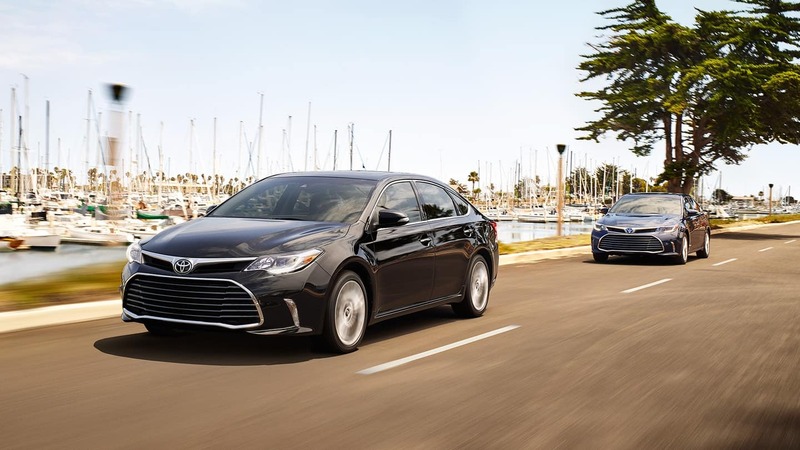 Its EPA-estimated 21 city/30 highway MPG1 earns the Avalon an impressive place in its segment and will save you trips to the pump as you put on the mileage. Its aerodynamic design, with diffuser panels underneath the chassis, lets it glide through the wind more efficiently, saving you fuel. The 2018 Avalon has a wide range of standard tech features and plenty of available options, as well. The standard Entune™ audio system includes a 7” high-resolution touchscreen display that you can navigate to listen to music, find directions, get traffic and weather updates and use your compatible smartphone hands-free. Tech upgrades include the available three-zone digital climate control, so each car region can customize its own air temperature—you can avoid a tangle of arms fighting over temperature knobs. And available rain-sensing wipers will adjust their speed to match any downpour, so you don’t have to. The Toyota Avalon’s interior is plenty roomy for passengers, no matter where they choose to sit. Front-row occupants will get 38.5” and 42.1” in head- and legroom, and those in the second row will get 37.9” and 39.2”, respectively. You won’t be giving up much if you choose the back seat. And, standard leather seating will only boost your comfort. The Avalon also has a large trunk for a full-size sedan, offering 16 ft3 of cargo volume. You can fit golf bags, groceries, luggage, and more easily with the Avalon’s ample storage options. Schedule a Test Drive with the 2018 Toyota Avalon Today! We hope our review of the 2018 Toyota Avalon helped you learn more about this full-size sedan! If you have any questions, you can always contact our expert team at Andy Mohr Toyota in Avon. We’ll be standing by to help you and other car shoppers near Avon, Indianapolis and Plainfield. When you’re ready, you can schedule a test drive and get behind the wheel of a 2018 Avalon yourself. If you book in advance, we’ll have your ride waiting for you when you arrive!